Buckblog: Weave Mazes: Your Take? Passages may only move under or over each other when they are perpendicular to each other. A passage may not terminate (dead-end) either under or over another passage. Passages may not change direction either over or under another passage. 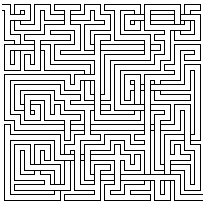 Before I post my implementation, though, I wanted to get you thinking: how would you implement a weave maze? If you used the recursive backtracker, you could apply those 3 rules above to decide if you can continue, instead of just terminating (and starting the back track) on the single “walls all around” dead-end condition. You may want to use a random chance for enabling these rules, as the maze may never branch much if it can always go over itself. In terms of storage you need only include the extra two states of a crossing passage, either up/down on top of left/right, or vice a versa. A more interesting (or at any rate more difficult) question: how would you generate a weave maze uniformly at random – so that every possible weave maze is generated with equal probability? PS. I don’t know the answer! It may be that there is no sensibly-efficient algorithm. @Robin, that is definitely an interesting question. I don’t dare touch it, though, since intuition is pretty useless when dealing with uniform spanning tree algorithms. :) If you ever do figure something out, though, I’d be very interested. As KevBurnsJr mentioned, I implemented a simple “perfect square” generator and host those mazes on a public server: http://amundsen.com/examples/mazes/2d/ using the maze+xml media type. Seems trivial to render a “weave” maze using that media type. My current internal storage of mazes is simply a set of “rooms” w/ “doors” (see dump here: http://amundsen.com/examples/mazes/2d/five-by-five/). If someone wanted to build a weave maze and pass me a version w/ this internal rendering format (1s and 0s for rooms), i’d be happy to host the maze so folks could work on clients to run against it.